Nancy's book is published as she is diagnosed with an ovarian growth. Nancy's book comes out, dedicated "To Melissa who was always a light in the forest" and there's a lot going on while her back is spasming and she doesn't feel quite well. Waiting in the car for Ethan after school, she has a dizzy spell, throws up, is interrogated by two very odd twin children, and blames the nervousness on her sudden success. Nancy sees Dr. Silverman the next day and gets an ultrasound to check for a possible fibroid tumor. The doctor decides they should do a laparoscopy. Elliot is naturally a little panicked and concerned. Nancy discusses doing a second book with Ethan. Michael and Hope have Nancy, Elliot, Susannah, Gary, and Emma over for dinner during which everyone makes nice. The next morning, while Nancy is in the hospital, Elliot makes breakfast and tries to get the kids off to school. While under anaesthesia she dreams of her kids. Dr. Silverman reports that there is some sort of a growth in the ovary and they have to wait until Monday to know. Returning home, Nancy and Elliot continue to dodge the issue with the kids. Nancy wakes up in the middle of the night and finds Elliot sleeping on the couch. She wants to discuss what would happen if something happened to her, which he is understandably not too keen on. Nancy exacts the promise that nobody should find out about what's going on. Nancy is a little late picking Ethan up from practice and Nancy finally loses patience with him, overwhelmed by her own stress. Later, she apologizes for yelling at him. The Westons get ready for the party Melissa is throwing for the book and everyone has a great time, completely unaware that Nancy might be sick. The results come back and Nancy has ovarian cancer. She goes to the library to do research and becomes overwhelmed by the literature. At home, she makes enough meals (and freezes them) to feed Ft. Bragg, all as a way to deal with her feelings of helplessness. Something at work goes very well and Michael wants to take Elliot and Nancy out to celebrate. Elliot tries to get out of it politely, but ends up having to tell him the truth. Nancy finally tells Ethan what's been going on and he takes it pretty factually. Hope is playing with Janey and Britty under the table, when Nancy shows up and it doesn't take long for her to figure out that Hope knows what's going on. When Elliot gets home, she's quite angry with him for telling Michael, all the stress of it coming out in her reaction. As she's crying and trying to push him away, Elliot insists that he won't leave her and they can fight the cancer together. Michael's secretary is Katherine--what happened to Paige? 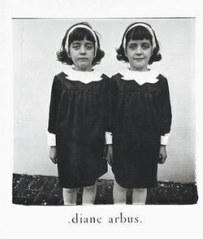 "I was at the High Museum in Atlanta, where I saw a Diane Arbus photograph - it was of twin girls and was creepy. Of course, I recognized the name - I can attribute much of my cultural knowledge to the show - from an episode of thirtysomething. 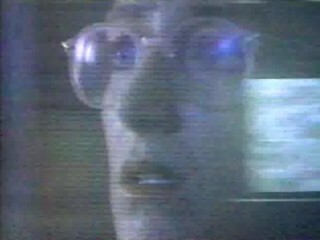 In "in another country", Nancy is telling Elliot about the twin girls in the restroom at Ethan's school. She says, "It was so weird. I felt like I was trapped in a Diane Arbus picture." Elliott responds, "Yeah, we never should have let her take our wedding pictures." ... When I saw the photogaph [at the exhibit], I did a little research and found that Diane Arbus committed suicide in 1971 ... her subjects tended to be of people who were physically unique - like giants and hermaphodites. ... [P]ossibly part of the theme of something going wrong when everything was going so right because the photo of the twins I saw was disturbing. The girls were dressed and posed exactly alike, but one had a bizarre look on her face, while the other was smiling quite nicely. The blurb under the picture suggested the image showed turmoil under a conformist, middle class existence, which brings to mind the book signing party for Nancy and Ethan." The point has been raised that while the book was dedicated to Melissa, she and Nancy never seemed particularly close. By the way, in episode 312 "another country", I don't think Nancy dedicated the book to Melissa, I think she just signed the copy she gave to her with that blurb Melissa read out-loud. I could be wrong, but I'm pretty sure of it. Again, a very good episode. It captures the absurdity of something like this striking out of nowhere just when life couldn't be going any better. I must ask though, why in the world do these friends tell each other anything when they know that Michael will tell everyone? I can certainly understand Nancy's desire to keep things quiet until she knows something more. Nancy: Do you think that's what this is? Success anxiety? Melissa: I don't know. How are your toes? Do you have trouble uncurling them? Nancy: Yeh I do. What do you think that is? Does it mean I've gone nuts? Melissa: No. It means you're my twin sister from whom I was separated at birth."